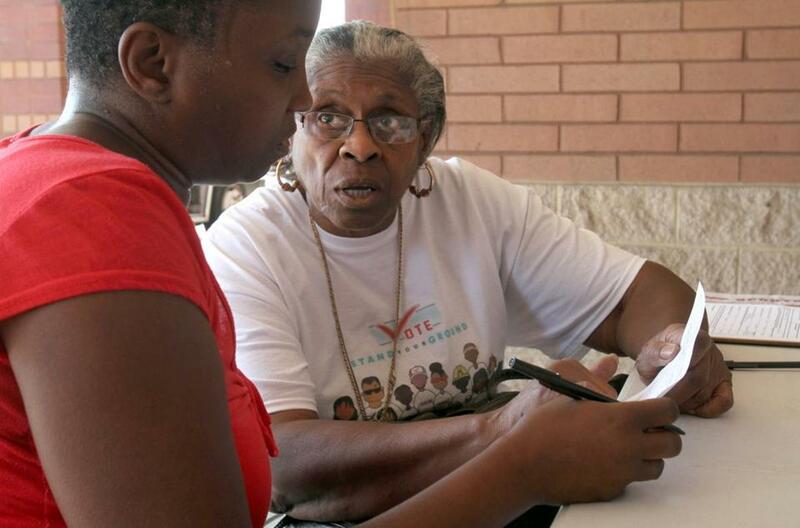 Volunteers from churches in Cleveland met to register voters and to make sure their votes count on Election Day. CLEVELAND — On a hip-hop radio station in northeast Ohio, a swing state where turnout among black voters may decide the presidential election, listeners are being exhorted to vote this year — not just for a candidate, but to send a message. Those “forces,” in the eyes of many minority voters in Ohio and other battleground states, are Republican state legislators who have sought to limit early voting and impose voter identification requirements — moves widely seen as an effort to tamp down turnout by African-Americans. In Ohio, that effort has mostly failed, with many new restrictions either overturned by the courts or hastily repealed by the Legislature itself in the face of popular uproar. But in the process, Republican legislators seem to have handed a powerful rallying cry to those seeking to maximize minority-voter turnout. “It’s suppression. It’s blatant,” said Michele Rudolph, 57, a retired county employee and resident of Maple Heights, a predominantly black community southeast of downtown Cleveland, who attended an early-voting cookout recently with other Obama campaign volunteers. Wielding a pink BlackBerry, Rudolph pulled up a message she posted on Facebook recently urging friends to “take advantage of the rights and privileges that people have tried so hard to take from us” when early voting begins in Ohio on Tuesday. A partial list of recent changes to electoral laws in a few battleground states. Since 2010, when the GOP took control of many swing-state legislatures in a wave of Tea Party-fueled victories, lawmakers have passed laws to limit early voting in Florida and Ohio and require photo identification to vote in Wisconsin, Pennsylvania, and other states. Other state laws have targeted voter-registration drives and provisional ballots. But rather than creating an advantage for Republicans, those moves may instead have stirred a backlash. Black voters, political analysts say, were never likely to support Mitt Romney in significant numbers. As recently as this spring, though, some Democratic strategists fretted that blacks, troubled by continued economic woes or President Obama’s support for gay marriage, might turn out at lower rates than in 2008. Those fears have eased. A September poll by the Pew Research Center for the People and the Press found that black voters are as enthusiastic now as they were at this point in 2008. And the sense that voting rights are under siege may be a contributing factor. “The fact that the Republicans are trying to keep black people from voting is only going to want to make them want to vote more,” said David A. Bositis, an analyst of minority voting patterns at the Joint Center for Political and Economic Studies in Washington. Ohio passed its early voting law after the 2004 election, when hourslong lines at some Ohio polling locations made national headlines. The legislation had bipartisan support, but Ohio Republicans shifted after the Obama campaign dominated early voting in 2008. Among other changes, the restrictions passed in 2011 would have shortened the early voting period and closed voting locations the weekend before the election, a time when many black churches participated in “souls to the polls” events in 2008. Supporters of the law said that the changes were not racially motivated and that local officials should have the weekend before Election Day off to update voting lists and prepare poll workers. They also have denied partisan or racial motives in a related controversy that flared this summer, when Jon Husted, Ohio’s Republican secretary of state, initially vetoed extended in-person early voting hours in Democratic-leaning counties while more Republican areas set longer early voting hours. But a Republican legislative leader in Pennsylvania, where the ID law passed on a party-line vote, raised eyebrows when he said the law would “allow Governor Romney to win the state of Pennsylvania.” And in Ohio, the controversy took on an overt racial tone when Doug Preisse, a local GOP leader and elections board member in Franklin County, alluded to race to explain why he voted against extended hours in the county that includes Columbus, a city that is 28 percent black. “I guess I really actually feel we shouldn’t contort the voting process to accommodate the urban — read African-American — voter-turnout machine,” he wrote in an e-mail to a reporter for the Columbus Dispatch. Seeking to quell the controversy, Husted eventually imposed uniform voting hours in counties across the state. Ohio’s tensions echo the storyline that has unfolded in other states, where legislators have cited financial constraints to curtail early voting, or raised fears of voter fraud to justify requiring voters to bring photo identification.Voter fraud, though, is extremely rare, and courts have struck down many voter identification laws on the grounds they create a discriminatory burden on poor and minority voters, groups a recent Reuters/Ipsos poll showed are more likely to lack IDs. In Pennsylvania, a judge heard arguments this week to delay the law. In Wisconsin, the attorney general, J.B. Van Hollen, has appealed to the Wisconsin Supreme Court to reinstate the voter-ID law immediately, but the court said Thursday it would not hear the case until after the election. But on Monday, a federal judge declined to block Florida’s law, which slashed the number of days of early voting from 14 to eight, and eliminated early voting on the Sunday before the election, among other changes. One of the ironies is that at least in Ohio, the advantage Democrats enjoyed in getting supporters to vote early in 2008 may be fading anyway. Republicans are running what political observers describe as a stronger ground operation in Ohio than John McCain did in 2008, and they have emphasized early voting. Husted’s decision to mail absentee ballot applications to all registered voters in the state is also likely to help the GOP; in 2008, Republicans contend, only some of the state’s 88 counties, largely urban jurisdictions, notified voters about their early-voting options. Meanwhile, even as last year’s effort in Ohio to restrict early voting continues to stoke anger, the legislation itself is unraveling. After the law passed, the Obama campaign and labor groups gathered enough signatures to force a referendum; to forestall such a vote, the legislature preemptively repealed the law this year. Lawmakers left in place only a few provisions, including the ban on early voting the weekend immediately before the election for all voters except uniformed members of the military and Americans overseas. The restriction on weekend voting is the last significant limit on early voting in Ohio still being contested. In August, a federal judge ordered the state to open the polls for all voters that weekend. The state appealed the ruling; a decision is expected soon. Alan Wirzbicki can be reached at awirzbicki@globe.com.